Each time my turn came up I knew I couldn’t swim, but I knew I had to jump in or the life guard would heckle me until I jumped. But, I also knew that as soon as I had jumped in and struggled and choked and sunk a few times, the life guard would swim out and grab me and push me over to the ladder on the side of the pool. One summer my best friend took swimming lessons along with my sister and me. My best friend couldn’t swim either and was always reluctant to jump off the diving board. But, after being heckled by the lifeguard he would jump in the water and then start to yell for help. His yelps soon became screams that he was drowning. Louder and louder he would scream and the life guard would just tread water and do nothing to save him. My sister and me and the other kids in the swimming class who were standing on the side of the pool watching and hearing his screams would become alarmed and beg the lifeguard to go rescue him. Then the lifeguard would say to us, “If he’s screaming, he’s not drowning! I’ll rescue him when he stops screaming.” And, when my best friend would stop screaming, the lifeguard would swim out and grab him and push him over to the ladder on the side of the pool. As I said, I never learned to swim during those childhood summers at the pool, but there is a lesson about life I learned from those miserable swimming lessons. It has to do with the way we confront difficulties in our lives, especially extreme difficulties. The lesson that we learned from Psalm 3 in Part 1 of this meditation is that God, not people, is our Rescuer and we should always look to Him and depend on Him in times of difficulty. Although this Psalm affirms that God rescues us, this Psalm doesn’t tell us when God will rescue us! While we can be certain that God will rescue us, He doesn’t always rescue us when we think He should. God doesn’t rescue us from our difficulties. In fact, sometimes it seems like He rescues us near the end of our difficulties! But, He certainly doesn’t rescue us while we are screaming. Because, if we are screaming or griping or feeling sorry for ourselves about our difficulties, then we must not be drowning in our troubles. We’re not at the end of our rope. Instead, we’re trying to gather the sympathy of others in hopes that they will help. 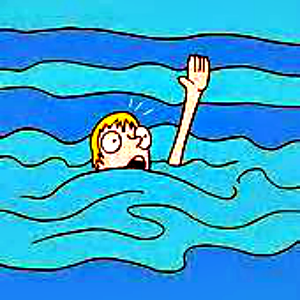 So, God rescues us when we start to drown! God rescues us when He is our only hope, when we only have Him to depend on! Sure, “rescue comes from the Lord,” but only at that point when we need rescuing! And most certainly, after the screaming stops! This entry was posted in deliverance, desperation, restoration and tagged Bible, desperation, restoration. Bookmark the permalink.